Introduction: A complete, radical “phrenic-to phrenic” thymectomy is the standard of care for myasthenia gravis. 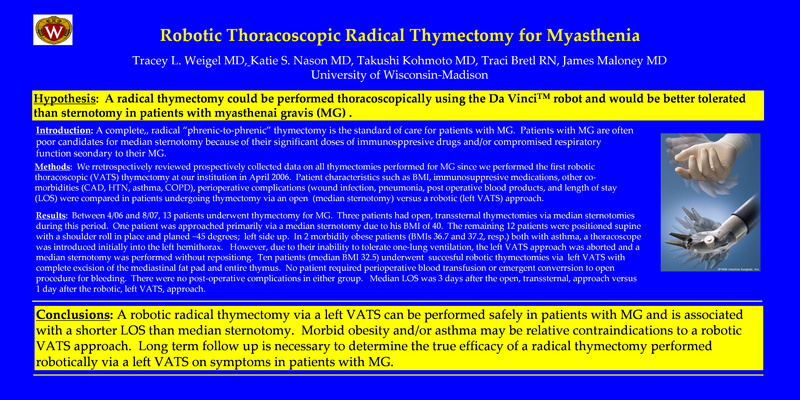 Patients with myasthenia gravis (MG) are often poor candidates for median sternotomy because of their significant doses of immunosuppresive drugs and/or compromised respiratory function secondary to their MG. We hypothesized that a complete, radical thymectomy could be performed thoracoscopically using the Da Vinci robot and would be better tolerated than a sternotomy in patients with MG.
Methods: We retrospectively reviewed prospectively collected data on all thymectomies performed for MG since we performed the first robotic thoracoscopic (VATS) thymectomy at our institution, in April 2006. Patient characteristics such as: BMI, immunosuppresive medications, other co-morbidities (CAD, HTN, asthma, COPD, etc. ), peri-operative complications (wound infection, pneumonia, post operative blood products) and length of stay (LOS) were compared in patients undergoing thymectomy via an open (median sternotomy) versus a robotic (left VATS) approach. Results: Between 4/06 and 8/07, 13 patients underwent thymectomy for MG. Three patients had open, transsternal thymectomies via median sternotomy during this period. One patient was approached primarily via a median sternotomy due to a BMI of 40. The remaing 12 patients were positioned supine with a shoulder role and the table planed ~45 degrees; left side up. In 2 morbidly obese patients (BMIs 36.7 and 37.2), both with asthma, a thoracoscope was introduced initially into the left hemithorax. However, due to their inability to tolerate one-lung ventilation, the left VATS approach was aborted and a sternotomy was performed without repositioning. Ten patients (median BMI 32.5) underwent a succesful robotic thymectomy via a left VATS approach with complete excision of the mediastinal fat pad and entire thymus. No patient required perioperative blood transfusion or emergent conversion to open procedure for bleeding. There were no post-operative complications in either group. Median LOS was 3 days after an open, transternal approach versus 1 day after a robotic, left VATS approach. Conclusion: A robotic radical thymectomy via a left VATS can be performed safely in patients with MG and is associated with a shorter LOS than median sternotomy. Morbid obesity and/or asthma may be relative contraindications to a robotic VATS approach. Long term follow up is necessary to determine the true efficacy of a minimally invasive, robotic VATS radical thymectomy on symptoms in patients with MG.